Here are just some of the reasons why we believe Xara stands out from the competition, making Photo & Graphic Designer a great choice for all your photo editing, illustration and graphic design needs. Photo & Graphic Designer allows you to do amazing things with photos, includes really intuitive vector drawing tools and advanced text handling, all in one seamlessly integrated environment. Photo & Graphic Designer's photo handling beats other graphics programs on many fronts. Photo & Graphic Designer photo handling beats other graphics programs on many fronts. It's much, much faster, produces smaller files and it's non-destructive. It makes the perfect photo composition tool. Photo & Graphic Designer offers completely non-destructive photo editing (which means you can edit your photo as many times as you like without the loss of quality that is normal in other photo programs), and it uses a fraction of the RAM required by other products. It can handle multiple very high resolution images with ease, even on a modest PC. Photo & Graphic Designer is also unique in the way it handles and stores photos, which means that files containing photos can be anywhere from 3 to 100 times smaller than with other programs. Photo & Graphic Designer includes a revolutionary integrated, ultra-fast, non-destructive photo editing tool. It offers both automatic real-time photo enhance and manual controls (brightness, contrast, sharpen, blur, saturation, temperature and a new cross process option) plus real-time scaling and rotation even on very high res images. Other features include flexible cropping, red eye removal, advanced shadow & highlights and brightness levels controls, perspective correction. Combine this with features such as vector masking, layer blending, feathering - all in the non-destructive, memory efficient way - and you have something that no other photo tool can provide. The powerful photo tools can produce almost miraculous changes and improvements to your photos! Photo & Graphic Designer includes a selection of 60+ creative 'Live Effect' plug-ins that can transform both photos and vector drawings (they are called Live Effects because the object remains editable even after applying the effect). Effects include oil painting, pencil and crayon drawing, crumple, fish-eye, waves, 'liquid paint' for creating caricatures and many, many more. Most modern Adobe Photoshop® plug-ins work as Live Effects, giving access to a huge range of free and commercial plug-ins for creating effects that would take a lifetime to explore. The Online Content Catalog (provided as part of the Update Service) also includes 125 ready-made photo filter pre-sets that you can simply drop on your photo to create popular effects and moods such as 'summer', 'vintage' and 'exposed' or interesting texture and photo effects. See some examples. The Content Catalog also provides direct access to a huge collection of royalty-free stock photos & illustrations from Pixabay. In addition there's an Effect Painter and flexible mask and region tools that enable you to enhance or apply effects to selected areas of a photo. Perhaps the easiest to use panorama maker. 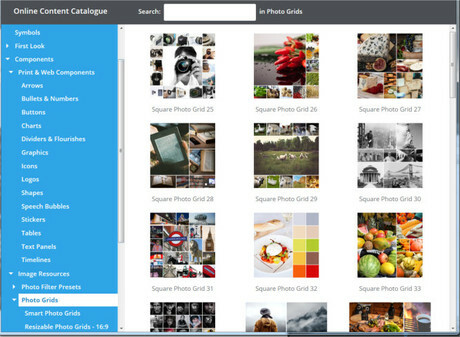 Drop a series of photos on the page, click one button and you'll get a perfect, seamless joined panoramic image. The Photo Tool includes innovative intelligent image scaling technology that allows 'content aware scaling', which means images can be stretched or squashed while retaining the proportions of important parts of the picture. This can provide a near miraculous ability to stretch and change the aspect ratio of photos, without apparently distorting the content of the photo. And there is also 'content aware zooming', which works in a similar way but allows you to resize the object that is the center of interest without increasing the size of the total image. Photo & Graphic Designer's powerful bitmap tracer can convert your bitmaps – typically photos, line-art or logos – into editable vector shapes. Photo & Graphic Designer offers all the tools that a creative designer could need for illustration and text handling. Photo & Graphic Designer is the primary tool of many illustrators and includes a set of powerful but really easy to use vector line and shape drawing and editing tools. The Quickshape tools (rectangle, circle etc) allow you to draw pre-set shapes very quickly and easily. Editing shapes and lines is easy and the Freehand line drawing tool even offers a slider for retroactive smoothing after you've drawn your line. And there's support for pressure sensitive tablets too. The powerful Shape Eraser and Shaper Builder tools allow you to easily erase or build on your image with a 'paintbrush' type action, whether it's a vector drawing or a photo. Photo & Graphic Designer offers everything you need for adding creative text to your designs. The Text Tool allows you to enter as many lines of text as you want, at any place in your document and at any angle, and you can also set your text along a curved path. Additionally, just like any drawn object in Photo & Graphic Designer, you can freely resize it on the page, and apply any of the effects, such as transparency, fills, molds and so on - and yet the text remains editable. Like any word processing program you have full control over the text styles, including font (with 600+ integrated Google fonts, and 1500+ Font Awesome / Google Material Design icons & symbols), color, justification, line spacing and kerning etc. and advanced design options such as full Open Type support. The world's fastest, slickest, and highest quality vector 3D extrude tool. Take any shape, and just drag on the face to create a beautifully lit and shaded 3D version. Drag on the sides to extend the extrude depth. It couldn't be easier. The blend tool tweens or blends from one shape to another. It's ultra-fast, click-drag simple, works with vector shapes, text and photos. Blends can be used to create complex highlights, blurred edges on objects, repetitive patterns and many other effects, in other words it's a vital tool for creative design. Photo & Graphic Designer performs blending in a very quick and memory-efficient way compared to other drawing packages - meaning less waiting for you and less draining of your systems resources. Xara was the first vector application to introduce transparency, and continues to this day to offer the easiest, most advanced transparency control of any software. With click-drag simplicity you can create graduated transparencies to any object, photo, text, and vector shape. 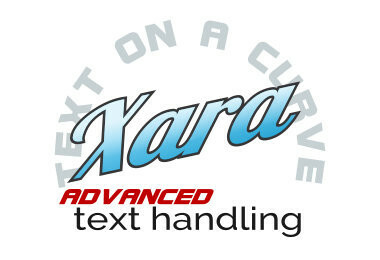 Xara was also the first application to offer vector feathering (sometimes called Soft Vectors). 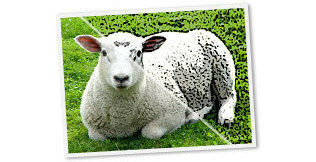 This is a technique of slightly blurring the edges of objects to help them blend into the background and enables high quality realistic images to be created more quickly and easily than in any other software. The combination of feathering and transparency is great for any photo composition work, as well as realistic vector shading, vital for any good illustration. A common professional trick is to tie the document colors to colors used within a key photo in that document. Normally this is a pretty time consuming, manual process but Photo & Graphic Designer includes a powerful new tool that will analyse a photo, identify the pre-dominant colors in that image, and create a color palette of those colors with the names Theme Color 1 to Theme Color 5. By using those Theme Colors in your document, and linked shades of those colors, you can quickly and easily give your design a harmonious, professional look. << Here's an example of just how effective this feature can be - the same text and layout with different photos, with theme colors based on the photo. Photo & Graphic Designer offers several powerful tools that allow you to add realistic effects with a single click. Apply, remove, and modify semi-transparent (or 'soft') shadows to any object with the Shadow tool. Use the Bevel tool to add bevels to any object, giving them the realistic appearance of depth. And add contours around objects with the Contour tool. All resolution independent (don't lose quality when you scale them)! An Online Content Catalog is offered as part of the Update Service and includes a selection of fully customizable templates including cards & invites. There's also a large collection of very flexible and easy-to-edit 'SmartShapes' such as tables, text panels, arrows, photo grids, charts, photo filters and many other resources of value for any graphic design task including a huge collection of royalty free stock photos & illustrations from Pixabay. You can see previews of a selection of the templates and other resources here. Photo & Graphic Designer also includes a font and texture fill gallery including 250 TrueType and PostScript fonts and 500 textures. Photo & Graphic Designer is famous for its speed and unrivalled ease of use, making it not just a highly productive tool, but a pleasure to be creative. Photo & Graphic Designer is based on the world's most sophisticated, highest performance vector rendering engine. Quite simply this makes it the fastest graphics software to be found. Just what you need when you're working with complex illustrations or huge photos! The Direct Action Tools allow you to create effects such as transparency, shadows, bevels or gradient fills in an interactive, fast and intuitive way. No distracting dialogs - simply drag on the object! Many tasks in Photo & Graphic Designer benefit from being able to use the drag and drop principle, which is the most intuitive way of working and a great time saver. It also supports drag and drop import of files, such as photos. Instead of dragging outlines when you draw, move, rotate or resize objects, Photo & Graphic Designer offers solid live object manipulation, which simply makes it much easier to see what you're doing! Only Photo & Graphic Designer is fast enough to do this on complex vector graphics. Being able to change what you have done is vital in a graphics package. Photo & Graphic Designer allows unlimited undo, making experimentation easy. The Zoom tool allows magnification up to 25,000%, perfect for detailed work. And it's super-fast and resolution independent too. Xara introduced the world's first vector anti-aliasing to bring maximum screen quality and is still a pioneer with the fastest, highest quality anti-aliasing available in any drawing program. 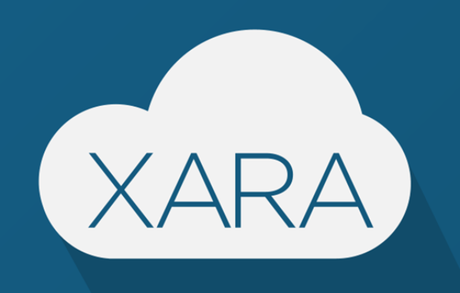 Xara Cloud offers an ultra-simple way to view, edit and update the text or images of your Xara design using a web browser on any computer or tablet (yes even a Mac or Android tablet! ), from anywhere in the world, and publish and share them. It's perfect for collaborative editing with friends, family or clients, or for anyone who needs to edit their work remotely. Photo & Graphic Designer benefits from seamless integration with Xara Cloud, making it a great additional service. You can find out more & register here. 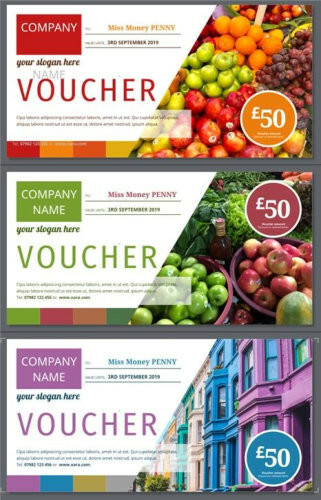 Photo & Graphic Designer is used by many different types of customer in a spectacular range of uses - for designs combining drawings, text and photos, for print and the web - so we understand how important it is to offer compatibility with other products and users. Photo & Graphic Designer offers support for a huge range of file formats, making it easy to exchange your work with other users and programs. 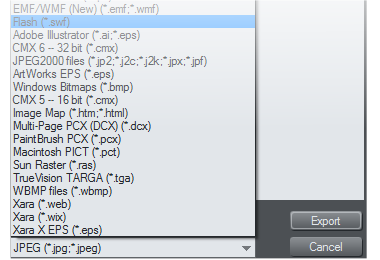 This includes common bitmap types (eg GIF, JPEG, BMP, PNG, TIFF, PSD, and RAW photos) and key vector types (eg PDF and AI/EPS, SVG, and EMF/WMF). For text Photo & Graphic Designer can import Word files (.doc and .docx) and supports RTF (Rich Text Format). 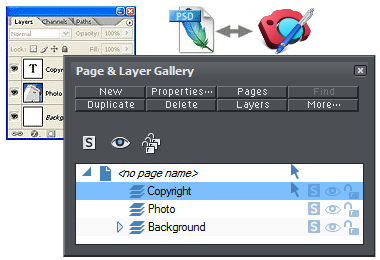 Photo & Graphic Designer has full support for importing and exporting Adobe Photoshop® PSD files including layer support. Photo & Graphic Designer offers reliable PDF import and industry leading export of super-clean, very compact PDF files (including support for graduated color fills and flat / graduated transparency), including PDF/X for commercial print. What's more Photo & Graphic Designer offers very flexible PDF editing, so it's easy to make alterations to existing PDF documents. And if you've ever wanted to use a graphic element from a PDF - maybe a logo, photo or text - then you'll find it is as easy as copy and paste with Photo & Graphic Designer. 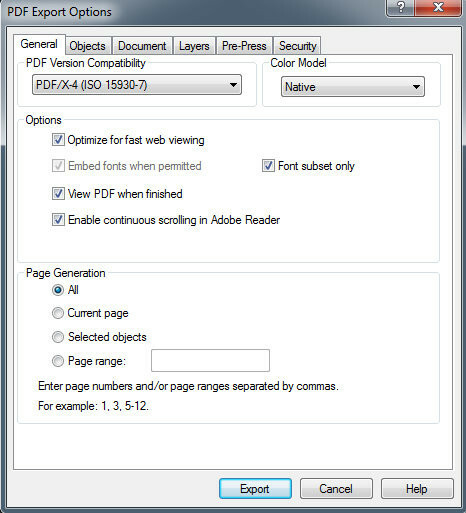 It's an ideal choice for any work with PDF documents. 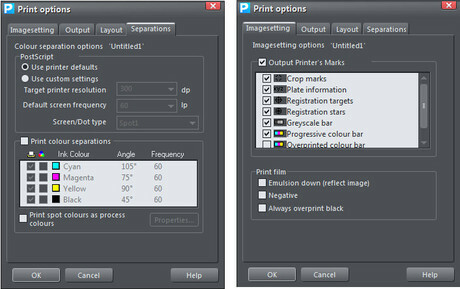 Xara Photo & Graphic Designer has the options you require for commercial printing, including PDF/X output. 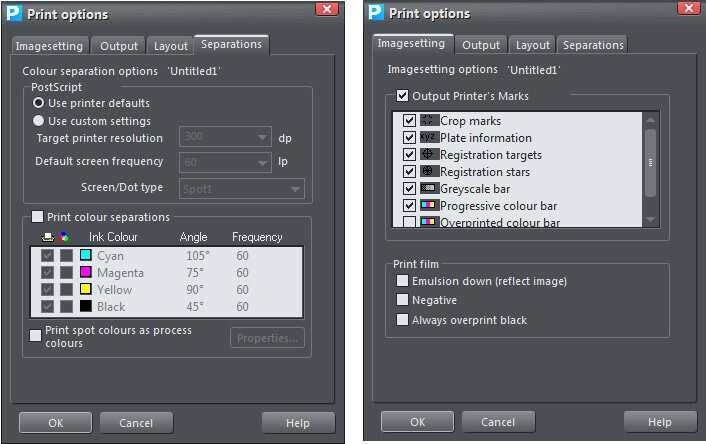 In addition it supports the conversion of RGB, HSV and grayscale colors to CMYK, and offers detailed imagesetting controls, including printer's marks and film settings, and the Separations dialog gives control over color separations and PostScript printer settings.